Behind the numbers at Tahrir Square it was the power of unions that pushed Mubarak out of power. Credit: Cam McGrath/IPS. CAIRO, Jul 13 2012 (IPS) - The independent trade unions that have sprung up across Egypt over the last 17 months face an uncertain future, caught between Islamists and the military and operating under labour laws that have not changed since Hosni Mubarak was in power. “The government and business owners don’t want to respond to workers’ demands or give them rights, so they are opposed to seeing workers establish independent syndicates,” says Kamal Abu Eita, a leader of the independent union movement. Under Mubarak, all unions were required to be part of the Egyptian Trade Union Federation (ETUF), which propped up the regime by blocking any industrial action that would undermine the state’s authority or supply of cheap labour. Membership in the state-controlled body was mandatory for most public sector employees, and union dues were automatically deducted from their salaries. Activists say the colossal labour organisation worked to prevent its four million members from holding strikes or negotiating for better salaries. It also mobilised large numbers of workers for pro-government rallies and bussed them to polling stations during general elections to vote for the ruling party. Cracks first appeared in ETUF’s hegemony six years ago when factory workers in the northern industrial town Mahalla El-Kubra defied their stooge government union leaders and went on strike to demand unpaid bonuses. Their defiant action resonated with the exploited working class, igniting a wave of wildcat strikes that enveloped every economic sector – and has continued to this day. The nascent labour movement provided fertile ground for the birth of Egypt’s first independent unions, but little nutrient to sustain them. The four unions that emerged while Mubarak was in power faced hostile workplaces, constant intimidation and harassment from ETUF, and a barrage of legal challenges. The dictator’s downfall, however, gave union activists more room to operate. Workers have set up over 500 independent syndicates in recent months. The majority have affiliated with two autonomous labour bodies, the Egyptian Federation of Independent Trade Unions (EFITU) led by Abu Eita, and the Egyptian Democratic Labour Congress (EDLC) headed by former steel worker Kamal Abbas. 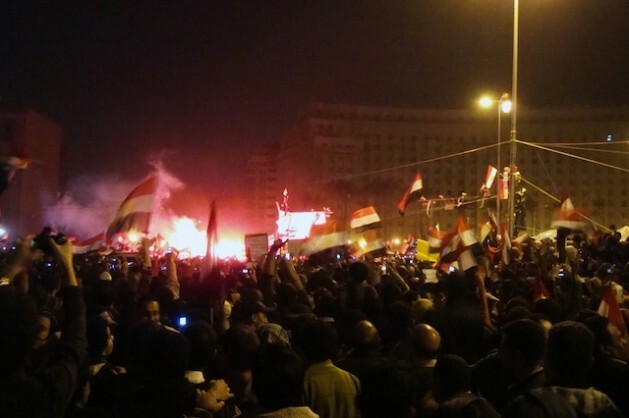 EFITU, formed just five days into the uprising against Mubarak, claims an affiliated membership of 281 independent unions comprising over two million workers. The younger EDLC covers about 250 independent unions. The pair, separated primarily by their policies of incorporation, has emerged to challenge the state-backed ETUF, which still claims nearly four million members. Proposed legislation that would govern union organisation was under review in parliament before it was dissolved in June. Without it, independent syndicates continue to operate in a legal grey zone – hampered by Mubarak-era legislation that only recognises ETUF-affiliated unions. The absence of regulation has allowed hundreds of loosely-formed syndicates to spring up, though arguably only a handful are in a position to defend their independence. Adel Zakaria, editor of Kalam Sinaiyyia (Workers’ Talk) magazine, says independent unions whose membership covers the majority of employees in their workplace or sector “have the muscle to get things done.” Smaller unions with shallow roots could be reabsorbed into the state-controlled federation. ETUF is proving to be a multi-headed hydra. The mammoth organisation was weakened by rulings that dissolved its executive board, put its leadership under investigation for corruption, and pulled the plug on 15 million dollars in annual government subsidies. Yet its core remains intact. The interim board appointed to administer ETUF is stacked with members of its old guard, while the federation continues to benefit from undemocratic systems set up by the former regime. One example of this – facilitated by state institutions – is mandatory membership dues. Workers who join independent unions are obligated to pay ETUF dues, even if they cancel their membership. Many activists believe Egypt’s two main powers, the military and the Muslim Brotherhood, are trying to rebuild ETUF as a counterweight to newfound syndical liberties. They claim the generals – opposed to organised labour – have sought to contain worker movements by criminalising strikes and preserving Mubarak-era labour laws. “The military would prefer a single, official trade union federation that the state can control,” says El-Banna. Muslim Brotherhood leaders once supported trade syndicate pluralism, but now favour a model that prohibits workers from organising more than one union within any given enterprise. Legislators affiliated to the Islamic group have attempted to hijack the proposed Trade Union Liberties Law – originally intended to support independent unions – and transform it into a bill that bars union pluralism. Setbacks in formulating progressive legislation could undermine the growth and legitimacy of independent unions. But defiant labour leaders point out that they did not wait for Mubarak’s permission to establish independent unions, and they have no intention of waiting for his successors to approve them.